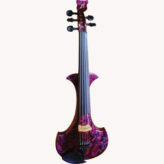 The Yamaha SV200 Silent Electric violin offers easy feedback-free amplification, effects, silent practice and more, with superb tone that approaches the quality of a high-quality acoustic violin. This is a perfect performance instrument for any venue. The SV200's dual pickup system delivers double resolution and expanded dynamic range. The pickups respond to subtle nuances making it easy to play with full expression, from pianissimo to fortissimo. 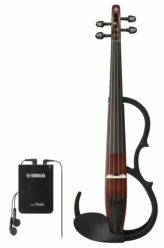 A special circuit isolates and controls the instrument's upper harmonics, providing broad flexibility to adjust for individual playing styles, room acoustics, and amplification equipment, while closely approaching the tone of an acoustic violin. 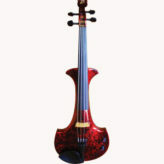 The Yamaha SV200's oval-shaped neck features a thin layer of specially formulated finish that feels identical to that of an acoustic violin, and the frame extends past the chin rest to accommodate most standard chin/shoulder rests. The line out jack is positioned so the cord can be draped over the performer’s shoulder where it is out of the way.